On a single spring day in 1998 (April 19th to be exact), a 'supergroup' of midwestern psychsters converged on the Funhouse Studios in Indianapolis, Indiana. All part of the Aether-Or family, members of Tombstone Valentine, Many Bright Things, Faraday Cage, and Twin Planet all took part in the improvisational jam session. I would imagine that these endeavors would rarely have a near-perfect success rate, so I'm astounded at the sustained quality that "Mushroom Honey" achieves, unless of course they recorded 18 hours of material and this album is only a small percentage of the archive. 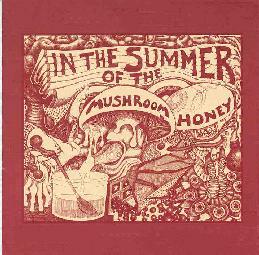 I guess it'll be no surprise to you that there are several jams over 10 minutes long on 'Mushroom Honey.' Well, four to be exact. Three are pretty much standard fare, but so well done that they are true standouts. "Thank you, Mr. Bishop," is downright peculiar and a bit hard to digest at times (that's good!). The weirdest point is when bassist/vocalist Ron Esposito begins speaking in tongues (or so it seems) to a tossed salad of intended feedback noises and other flanged guitars. Something akin to the Zendik Tribe down in Texas anyway. Much of the album is more subtle oriental-flavored psychedelia, with the obligatory hand percussion and occasional sitar appearance. But what makes it all work is the clear, soaring vocals from TV's Richelle Toombs on most tracks. Some times there are actual lyrics or readings from obscure texts, but often it's simply the addition of her 'space whisper' singing that adds the right amount of 'coloratura' to the throbbing and pulsating music below. On my favorite tune "Sweet Water," Toombs' singing could almost be considered gospel, but this spiritual nature and the deftness she displays at vibrato control are truly wondrous. The finale "Shining Brightly" does just that, another acoustic song with pretty vocals from Toombs dancing around light guitar licks... the kind of thing that seems to be most often recorded in northern Wales for some reason. I give this album strong marks for being spontaneous and uplifting, yet still captured as a near flawless recording with a good mix and instrument separation. I'm not certain it needed to be 72 minutes long, but I'm sure that urge exists simply because of the nature of the medium. (The single LP version was necessary edited down.) I've enjoyed what the individual bands have done on their own, and so it would have been hard to imagine how this could have gone wrong. I don't know whether the title is more for the album or the collective itself... but assuming it's the former, I'd like to dub this group "Amon Düül 1 1/2." For more information you can visit the Aether Records web site.